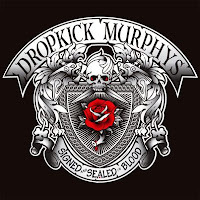 It pains me to say it, but as a long-term, borderline obsessive fan I really don't see where Dropkick Murphys have left to go. An established stable of America's Celtic punk scene, the Bostoners have spent the past 17 years enhancing and arguably even defining the genre with the fine and thoroughly consistent reaches of their back catalogue. Hitting their stride in the early '00s, the seven-piece delivered a string of records in Sing Loud, Sing Proud! Blackout and The Warrior's Code which all but perfected their niche, with the latter achieving a level of commercial success only matched by subsequent outings. With that in mind, 2011's Going Out In Style stood as something of a final creative frontier; a relatively lavish concept album which, while not wholly removed from a musical perspective represented without doubt their most ambitious and expansive foray to date. It didn't quite belong in their top tier, but that wasn't so much an issue as the fact it left such little leeway regarding their next move. Perhaps wary of progression for progression's sake, the group adopted quite the opposite approach for this eighth studio LP. According to bassist Ken Casey, it's "just us having fun and making the most catchy, singalong songs we can;" in other words, a record made on impulse for their fans, especially those who carry their mark in tattooed form. It's a universal, brothers-in-arms motif which existed right from their street-punk roots, yet one which until now has never been alluded to with such hefty weight of feeling. It does, of course, help that the title and some of the songs on Signed And Sealed In Blood make explicit reference, and it's no coincidence they're the strongest on offer. 'The Boys Are Back' for instance opens proceedings with the type of purposeful masculine romp they've long since mastered, and although slightly predictable carries a passion and bluster that's difficult to resist. The same is true of 'Rose Tattoo,' a fabulous, rousing ode to their art-embroidered followers rife with refrains such as "with pride I'll wear it to the grave for you" and "signed and sealed in blood, I would die for you," the power of which is undeniable. Unfortunately, they prove to be exceptions as opposed to exemplifiers, with other material by and large illustrating the dangers of pandering to existing converts. Perhaps at the head is the air of complacency it can spawn, an understandable but near-chronic fault this album undoubtedly suffers from. The playing is as intense as ever, the gang cries are drilled to perfection and Al Barr's vocals are spat with untamed vigour, but in truth these elements hardly matter when set to songs which sound so tired and tossed off, devoid of both risk and excitement. If some of them sound overly familiar, that is probably because they are. 'Out Of Our Heads' is case in point, it's upbeat banjo being practically identical to Going Out In Style's 'Climbing A Chair To Bed' whilst offering nothing in the way of improvement or acknowledgement by means of justification. Then, of course there's the baffling inclusion of festive tune 'The Season's Upon Us;' one I thoroughly enjoyed belting out a week ago yet can't see resonating in a month's time, never mind come the middle of July. That particular number would surely have been better served as a stand-alone single or separate bonus track - not lumped into a collection released mid-January and designed to be enjoyed the year around. 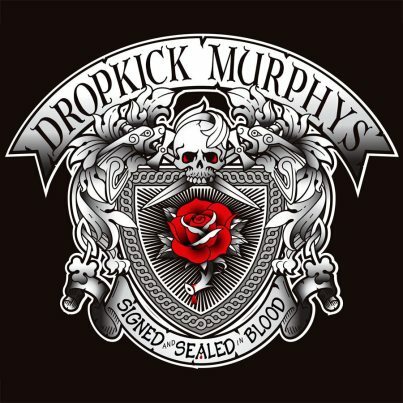 In some ways, it's difficult to criticise Dropkick Murphys for planting themselves in a comfort zone. This, after all, is a band who has fulfilled (and probably far surpassed) everything it originally set out to do, and as such should probably be allowed the odd shot of indulgence. There are in fairness moments where Signed And Sealed In Blood's slack approach works wonders, but all too often they're undermined by a subconscious reluctance to excel beyond the minimum requirement. The end result is a record that is perfectly adequate, yet arguably their weakest to date - and a future which could well rest on their willingness to break free of such idle practises. Signed And Sealed In Blood is released on 7 January in the UK and Ireland, 8 January in the USA and Canada, and 11 January in the rest of the world.